Alongside a variety of exquisite locations and landscapes, the rice fields in Vietnam are some of the most photographed and celebrated terrains in Southeast Asia. Not only providing the countries staple ingredients, these sites also give travellers on Vietnam tours the chance to delve into the culture, beauty and delights of the country. Take a look at some of the spectacular rice fields of Vietnam and how they are cultivated to provide the country’s most prized ingredients. Like many other countries in Asia such as China and Japan, rice is an ingredient used in most dishes and cuisines. 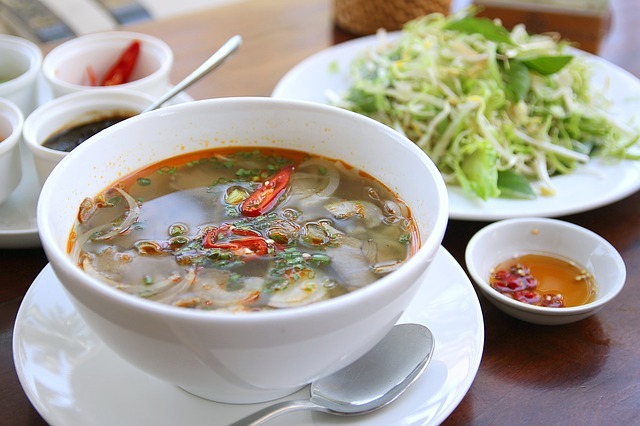 However, in Vietnam, rice is combined with other tastes and textures such as fish sauce, shrimp paste, and soy sauce to give the dishes extra saltiness. It is often combined with a wide variety of seafood. It is also known as “white gold” to the Vietnamese and also named ‘Dhanya’, meaning “the sustainer of the human race” in India. The season for growing and harvesting rice is in the autumn months of September and October. Then, farmers and pickers are busy cultivating their crop ready for processing and, eventually, selling on to trade. Sapa, located in northwest Vietnam and 4,921 feet above sea level, offers terrific views of Vietnamese rice terraces and is known to be the most popular in the whole of Vietnam. However, if you are looking for somewhere a little more secluded but still has the same cultural diversity and rugged scenery, then Mu Cang Chai is a great destination off the beaten tourist track. It is situated in the rural district of Yen Bai Province in the northeast region of Vietnam. Its rice fields and terraces have been recognised as the national landscapes by the country’s Ministry of Culture, Sports and Tourism. It is full with steep, narrow set rice terraces that line the mountainous landscape. Because it is 3,280 above sea level and in a different weather climate than Sapa, the rice crop at Mu Cang Chai is ready to harvest three weeks later than the rice fields on the opposite side of the country. Rice cultivation and production dates back to the 18th century and the Khmer dynasty in Vietnam. With French colonisation in the 1800s, they brought modernisation and helped spurred on the development of a maze of canal systems in the Mekong Delta. The goal was to increase rice production to three times a year. More recently, however, the Vietnamese took over and gained absolute control of the present rice fields from the Cambodians who previously owned and dominated “Lower Cambodia”. Now, the Vietnamese have some of the largest rice production numbers in South East Asia. In 2007, 35,567 tonnes of rice was harvested. Although there are 1,600 varieties of rice grown throughout Vietnam, the most popular are white rice, jasmine, sweet or sticky rice helping to bring Vietnamese cuisine across the globe. Today, a total of 12 provinces constituting the Mekong Delta are known as the “rice bowl”. There are more than 17 million people who live within the region. 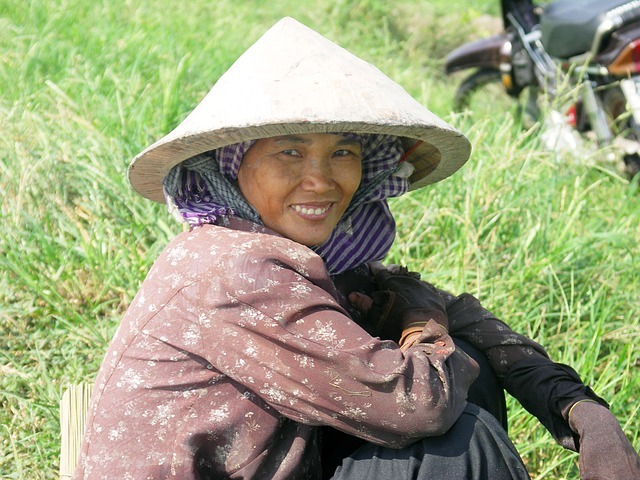 More than 80 per cent of the residents are associated and engaged with rice cultivation in Vietnam. 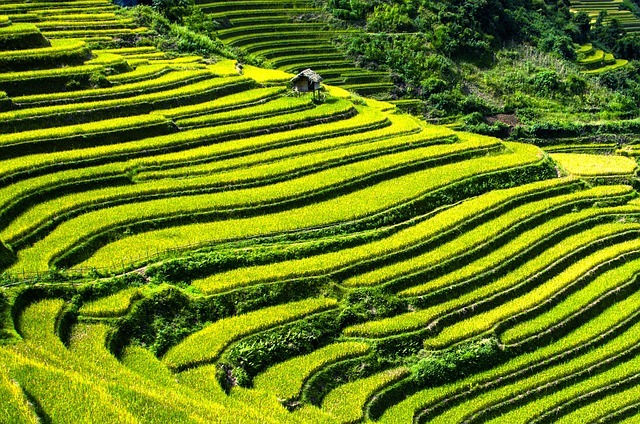 Due to Vietnam’s mountainous terrain, rice terraces were built in abundance across the country. As well as being visually spectacular, the design of the rice terraces enables more effective farming as it decreases any chance of erosion. It also supports better irrigation for the rice crops. 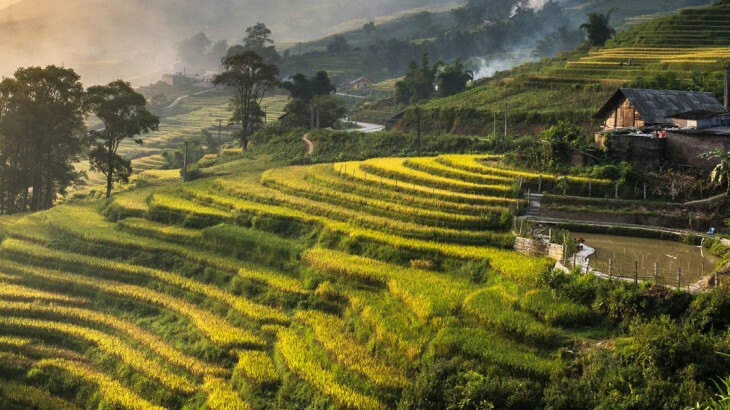 For those looking to experience the rice culture and glorious visual display of the rice terraces in Vietnam, Sapa is one of the most popular tourist attractions. With a backdrop of the bamboo woodlands, it really is a must-see spectacle. Alongside the practical design of the rice terraces, there are three eco systems in Southeast Asia that help the rice growing culture in Vietnam. The southern Mekong Delta ecosystem dominates rice production which requires a warm and humid climate with lots of daylight time. The northern portion of the delta helps support the growth of rice varieties needing colder winters. The flood-prone conditions of the north helps to activate the growth of mountainous and upland rice varieties. For varieties which rely on the northern delta eco-system, the build-up of the nutrient alluvium over a number of years help to create an optimum rice harvest. The nutrient has also had a profound effect on the growth of other aquaculture and aided in the development of other agriculture opportunities for the local people who live on the Mekong River. Fruit trees and mangrove forests thrive in these conditions, as well as saline water shrimp within the paddy rice fields. 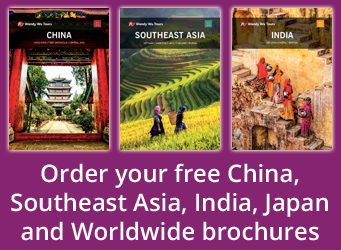 Book a guided Vietnam holiday with the Asia experts, Wendy Wu Tours. Our award winning escorted, fully inclusive tours visit all the major sights of Vietnam for an unforgettable holiday. Vietnam nature, photography, sightseeing, vietnam news. permalink.